Quite often, refurbished computers start their life as business machines, built to the latest specs with business-grade components. When the budget or lease says ‘replace the computers', that's what the business does, whether the computers need it or not. There's nothing wrong with them, and they've likely been babysat by a corporate IT department who kept them in perfect condition every day. These are great machines that are still plenty fast for home use, both desktops and laptops. Plus, because business-grade components are more durable than the consumer ones, the entire system has been built to last longer and perform better, often up to several years without a problem. Rather than send these impressive machines to landfill, we check and replace necessary components and re-install a clean operating system. Next, we put them through a stack of verification tests, then pack them up ready for their new home. When you talk to us about buying one, we'll always make sure you get a system that not only keeps up with your needs now but gives you breathing space for the next few years too. What are the benefits? You save a LOT of money: You get yourself a great computer that's been set up and checked over by an expert technician, for significantly less than the cost of buying new. 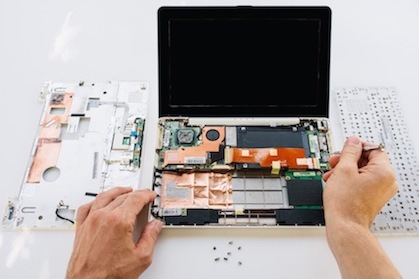 Add in the fact that when you score a refurbished business computer, you're also getting more durable, higher-quality components that will last you for years longer than the off-the-shelf consumer model, it's a definite win. We always recommend that when you see a refurbished deal that's got you smiling, you act fast - it won't sit around waiting for you! Covered by warranty: A warranty is always included with our refurbished computers, giving you value plus peace of mind. We guarantee that buying refurbished was a great decision. Problems are sporadic since your computer has been through stringent checks, but if anything pops up that's giving you trouble, we'll fix it fast. Forget the delays and hoop jumping you might get with your other warranties; we stand by ours with rapid action. You're saving the environment: Fewer machines end up in the landfill, and fewer resources are used for unnecessary manufacturing. When you consider each computer requires a certain amount of precious metals to be mined, plastics to be created, packaging created from multiple materials and all the associated flow-on effects of shipping, refurbishment is the right choice for the future. While you might not personally see the environmental impact of your decision to buy refurbished, rest assured the planet appreciates it! Are they reliable? Some people think that refurbished computers are more likely to break, when in truth, in some cases they're more reliable than brand new. Manufacturers have an expected failure rate, a percentage of computers that go straight from the factory to buyers who discover their expensive new system is dead-on-arrival or breaks within weeks. A refurbished computer has already stood the test of time, and it performed without missing a beat. By the time it's gone through our checks and repairs (both required and pre-emptive), a refurbished computer is better than new. So what are you waiting for? Contact Computer Corner to get your new or refurbished computer!